Trend following is probably one of the most popular spread betting strategies utilised by traders. When a market moves in one direction for a sustained period, we call it a trend. Trends – both up and down – figure in financial markets for long periods. For instance you might decide that the FTSE 100 index is on an uptrend if it makes new highs each week for three successive weeks – so you might place a bet on the FTSE 100 continuing to rise. Or you might spot the price of gold reaching new lows during the daily trading over a number of days and you could place a trade on the weakness to persist. At any one time, there can be several trends at work in a particular market. So, a share might be in a long-term up-trend, but in a short- and medium-term downtrend. The basic idea is that you allow a trend to run its course, and cut the trade when the market starts moving against you. You might get one hell of a move, or you or you might end having to take a small loss. You could probably enter the stock market in a random fashion and still make a gain using trend following if you manage your exits correctly! Trend trading follows the assumption that at anytime a trend is more likely to continue than it is to reverse. A lot of spread betting amateurs who are looking at spread betting the markets make the mistake of thinking they can predict where the markets are heading. They seem to think that just because a market goes down enough it has to come up right away, and pick almost arbitrary moments to buy a falling market or sell a rising market. I know from my discussions with people in the industry that this is a critical mistake a lot of spread betters make. So next time you see a market moving up or down very rapidly you’re probably better off to go with the trend, if your nerves and your bank account can’t take it though, best to get off the roller coaster! When you’re trend trading, your edge lies in the fact that markets are prone to over-reacting, which means that you’ll likely to profit long-term if learn to cut your losses short and let your profits run. Trend trading involves the trader first identifying an existing trend (whether the price is moving upwards or downwards) and then placing a trade backing the prevailing trend. This is mainly used in determing entry trades. In this respect pricing resistance and support levels can give you an indication of the strenght of the trend and how long it might continue or whether a reversal is probable. In the chart below, you can see a clear downtrend in the price of British Land. In a downtrend, each high and low is generally lower than the ones before them, while each high and low in an uptrend is generally higher than the previous ones. By drawing a line through the lows of an uptrend – or the highs of a downtrend – we create an easy reference-point for a trading strategy. An alternative to a hand-drawn trend-line is to create a moving average of recent prices. 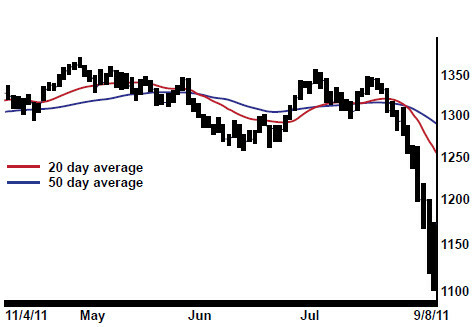 In the chart above, a 38-day moving average is shown. Note how the price tends to rally towards this average, before resuming its downwards course. Alternative, a spread trader might decide to enter a long position in a market if the 30 or say 50-day moving average is rising – meaning that the price is trending up and if the price is also presently above that average. You would try to enter the buy trade once the price moves back to the 50-day moving average and bounces off it (placing the stop loss just below that average). With these methods the spread traders is checking the underlying price momentum before working out their trade plan. An uptrend is identified by a series of higher highs/higher lows while a downtrend is characterised by a series of lower lows and lower highs. Most traders would translate the former pattern into a ‘bullish’ market and would buy the asset while the latter is generally a sign of a ‘bearish’ market and a possible sell signal. Such movements – whether to a trend-line or to a moving average – are often excellent opportunities to jump aboard in the hope of catching the next move downwards. You can either enter a sell trade as soon as it hits this level, or wait until it actually resumes its larger trend. If you think you might not be there to place the order when it does, you can enter an order to trade at a certain price. In the same way, you can use the trend-line or moving average to manage the risk of your trade. If the line gives way and the price breaks through it, you know there’s a greater risk that the trend is reversing. To reflect this, you can place your stop-loss order above the relevant line for a sell trade or below it for a buy trade. Assuming you’re right and the trend resumes, you can also use the trend-line or average when deciding when to take profits. When a market moves a long way above or below a line, it’s a clue that it may be getting overbought or oversold respectively, and thus due for a correction. Trend trading is a much more successful strategy if treated over longer timeframes and if you wish to learn more about this trading strategy I would suggest you to read a book called Trend Following by Michael Covel. In general, the shorter the moving average period, the more the average will move around in line with the price. Longer moving average periods make for more stable averages. When a faster-moving average crosses above or below a slower-moving average, some spread traders use that as a signal to buy or sell. A decent charting package will allow you to plot the distance between today’s price and its moving average, expressed as a percentage. So, if the price today is 110p and the moving average is located at 100p, we’d get a reading of 10 per cent. Comparing this number to levels from the recent past, we can get an idea of just how over-extended a market is at any moment. Some traders even try to time opportunities to place a contrarian spreadbet, which means they believe that a particular trend is coming to an end and will reverse but this is a separate topic in itself. Normally trend following tactics are executed on longer time frames; however in practice it can be done on any timeframe. Trader Opinion: Does trend following work in the long term to extract a long-term profit? If your trading system is designed to get you into a trending market and exit when markets have stopped trending, then chances are that it will work. But if you are merely relying on support and resistance levels (which are only confirmed with hindsight) or signs that the market may be oversold, good luck to you, because you’ll probably need it! Things is, you need to know what is happening at this very moment. The people participating at this moment are the ones who will move the market. Will these market participants look at technical analysis? Perhaps but not likely – not the guys with real big monies anyway. And even if they do, odds are that they are going to be contrarian to what technical analysis tell you to do. If technical analysis tells you now is a good moment to buy, they are going to sell. Just ponder for one moment. Fibonacci? Gann lines? Stochastics? Bollinger Bands? What are such things anyway? They are different ways to sort data but such indicators are computed after the fact so how can you use them to try predicting the future? Just tell me how a Gann line can tell you what Jack at ABC hedge fund is going to do? Likewise, the same applies to trendlines since these change depending on the timescale of a chart. Note: The very fact that a particular market has fallen from 8 to 5 does not mean that it is trending. It simply means it trended. It might be about to turn around and shoot up to 16 for all you know! As long as markets keep over-reacting (i.e. until such time as human nature changes), trend following is likely to work and you’ll profit if you cut your losses and let your profits run.